Esad Durakov holds a PhD in the field of Arabic literature from the Faculty of Philology in Belgrade and is Professor of Arabic Languages and Arabic Literature at the University of Sarajevo. His research interest focus on literary interpretation from Arabic. Through analysing ancient and classical Arabic literature, including the Qur’an, from within the Arabic literary tradition, this book provides an original interpretation of poetics, and of other important aspects of Arab culture. Ancient Arabic literature is a realm of poetry ; prose literary forms emerged rather late, and even then remained in the shadow of poetic creative efforts. Traditionally, this literature has been viewed through a philologist’s lens and has often been represented as ‘materialistic’ in the sense that its poetry lacked imagination. 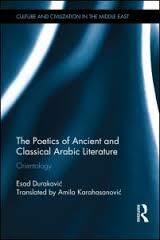 As a result, Arabic poetry was often evaluated negatively in relation to other poetic traditions. The Poetics of Ancient and Classical Arabic Literature argues that old Arabic literature is remarkably coherent in poetical terms and has its own individuality, and that claims of its materialism arise from a failure to grasp the poetic principles of the Arabic tradition. Analysing the Qur’an, which is known for confronting the poetry of the time, this book reveals that ‘post Qur’anic’ literature came to be defined against it. Thus, the constitution and interpretation of Arabic literature imposed itself as a particular exegesis of the sacred Text. Disputing traditional interpretations by arguing that Arabic literature can only be assessed from within, and not through comparison with other literary traditions, this book is of interest to students and scholars of Islamic Studies, Arabic Studies and Literary Studies.